Part of Texas’s unique climate are the cold temperatures that typically span from November through February. Although trees have a more distinct presence in Spring, Summer and Fall, the cold temperatures of Texas can present unique challenges for the beautiful trees of our landscapes. Over the past week we have had a steady amount of precipitation compounded with freezing temperatures at night. There are several reasons this can have a negative impact on trees. One of the first being that some trees have biologically weaker wood and limb-to-trunk unions. A perfect example of this is the Bradford Pear tree, a prevalent and slightly contentious tree of DFW. Although a full and well-shaped tree after blooming, the limbs of the Bradford Pear are extremely weak, and it is known to have a lifespan of under 25 years. For specimens like this, the additional weight of frozen precipitation on the branches and limbs can be the “straw that breaks the camels back” or rather a large limb off the shade tree in your front yard. Another direct way that damage from the cold can impact your trees is if the tree has previous decay, damage or existing cavities. The first and most obvious reason is that the additional weight of frozen precipitation on the canopy can push those already compromised areas over the breaking point. Alternately, moisture that builds up in these areas can freeze and expand, causing a variety of damage. As a home owner it is important to understand some of these potential negative impacts, especially if the tree in question has potential targets; A target being anything of value, including homes, cars, (or God forbid) a bystander, that could be damaged from limb or tree failure. Although some tree failures are unforeseeable, there are steps and monitoring that can be implemented to mitigate the chances that this happens to your tree. This highlights the importance of receiving consulting from an ISA Certified Arborist. 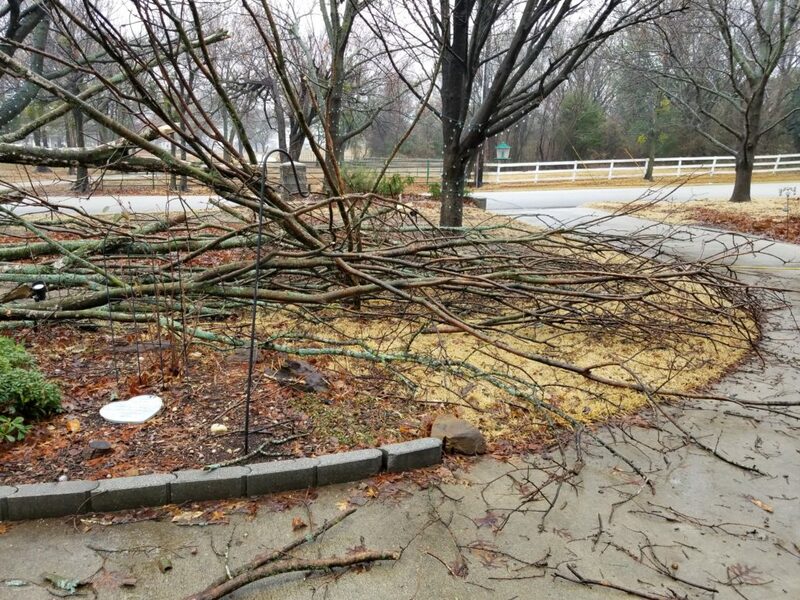 Some steps in prevention of tree or limb failure due to cold include thinning and structure pruning. Thinning involves lowering the density of the canopy that does not impact overall tree health. Thinning can provide a variety of benefits including more airflow and sunlight that passes to the deeper portions of the canopy, as well as reducing the overall weight of a tree’s canopy. Structural pruning is the method in which limbs are cut to give the tree the optimal structure for growth and strength. An important detail in structural pruning is the observance of included bark. Included bark is a portion of bark between limb-to-trunk unions that is relatively weak and depending on the situation can be a determining factor in removing large and high break-potential limbs. These pruning techniques must all be done properly to prevent damage or the creation of cavities which could lead to future problems. Overall, it is a crucial step to understand the type of trees you have on your property, any defects a tree may have, opportunities that could lead to tree or branch failure and potential targets of failure. With professional consulting from a Certified Arborist and proactive steps to mitigate future problems, prevention and education can help move us in a direction of mutual benefit for the trees of our landscapes.